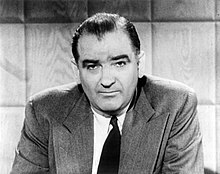 Joseph Raymond McCarthy (14 November 1908 – 2 Mey 1957) wis an American politeecian that served as a Republican U.S. Senator frae the state o Wisconsin frae 1947 till his daith in 1957. This page wis last eeditit on 26 October 2018, at 05:03.